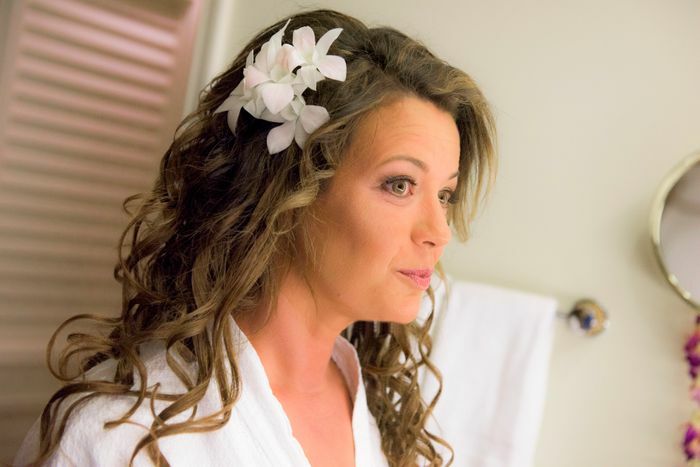 Hair and Make up services are a very important part of your Maui wedding. Trade winds are present all year long and hair should be put up by a professional to keep it in place in a flattering way. Our stylists come to you at your hotel or condo and always bring flowers so should you want fresh flowers for your hair, they are always available.You'll be part of a photo session for at least one hour, usually longer and a professional hair and make up stylist will make the photographers job that much easier and the results that much sweeter. In room hair and make up services - From $265.00 ($300.00 before 8AM) Plus parking fee at certain resorts. $30.00 additional per person when appointments are scheduled to begin prior to 8 a.m. Parking fees at resorts will be added to your invoice.